1st impressions - magnificent, awe inspiring, very spectacular, dominates the Newcastle skyline. If you are a corporate sponsor or have lots of money then great, otherwise, especially as an away fan, dig out those high powered binoculars. If you're getting on a bit and/or have a dodgy ticker then take several deep breaths before ascending the 14 flights of stairs to the bottom of the away section. Away fans are stuck in the farthest corner of the ground, binoculars required, while 2000 + seats remained unsold in the main stand with excellent views - could this be due to the price? - OK if you've got loads of cash or are a corporate bod otherwise its back to the binoculars. To be fair the ground has been re-developed beyond all recognition of the old St James Park, and has significantly improved facilities. Two sides of the ground are approx. twice the height of the other two to take the capacity to 52,000 (away 3,000+) which is needed to compete at the highest level and allow as many people to experience the atmosphere and watch the toon. The stadium is all the things mentioned in 1st Impressions, but that doesn't make the view of the pitch / players any better. Not sure how this compares to views from the back of the stands at Old Trafford etc, when I went to Man Utd to watch my team, we were given a section of the stadium much nearer the pitch. As you may be able to tell we were not at all impressed with the way we were treated, after paying for 2 tickets, and a 600 mile round trip, we expected a bit more. Like being able to see the players without the aid of binoculars. 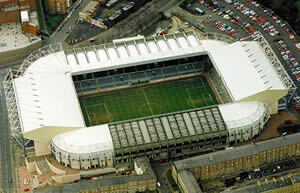 It is unlikely that we will be returning to Newcastle to watch football again!... oh yeah... and for the record... no my team did not lose! Follow the A1, A68 then A6127 to cross the Tyne. At the next roundabout, take the first exit into Moseley Street. Turn left into Neville Street, then right at the end for Clayton Street and then Newgate Street. Then turn left for Leazes Park Road. Take the A69 towards the City Centre. Turn left into Clayton Street for Newgate Street, then left again for Leazes Park Road. Take the A1, then follow signs for Hexham until you get to Percy Street then turn right into Leazes Park Road. Newcastle Central is half a mile from the ground. A taxi will cost about ?3.00. To walk it, cross the road towards the Bakers Oven and turn right down Central Street. Turn left into Grainger Street and left again into Westgate Road. Turn right into Bath Lane and the ground is on your right. The Metro Station is right next to the stadium, though if you are taking the Metro it may be quicker to walk from Monument station instead. There are many buses which head in the direction of the ground. Get off at Gallowgate. Street parking is best around Barrack Road and off Stanhope Street. Car parks near the ground include The St James' and Corporation Street. There is a multi-storey Greenmarket car park signposted from Corporation Street. We parked in the Eldon shopping centre car park, which was very handy for the shops and the town centre before the game, but be ready for the 30 - 40 min. wait to get out after the match. We stayed over in Richmond (approx. 1 hr from Newcastle) which was very nice and recommended as it's within striking distance for any of the north east clubs. Lots of pubs and places to eat and stay, plus a castle to visit on the Sunday. Good overall view of the pitch, city, Angel of the North, river Tyne and South Shields which is on the coast several miles away. If you are a registered user then you can login, and create your own personal review of Newcastle United Football Club - St James' Park. These reviews can be private or public.